Peanuts and chocolate are a classic combination that never goes out of style. 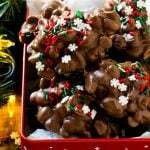 This easy candy can be made in the crock pot with just 5 minutes of prep time, it’s great for holiday parties or to give as gifts. The holidays are here, which means there’s a lot of celebrating and gift giving going on! There are times when I have the energy and patience to sit and decorate intricate holiday cookies by hand, and times where I need a quick hostess gift or party food contribution without a lot of effort. This crock pot candy is SO simple to make, tastes delicious and looks impressive. It’s perfect for gifts, parties and any time you just need a bite of something sweet. 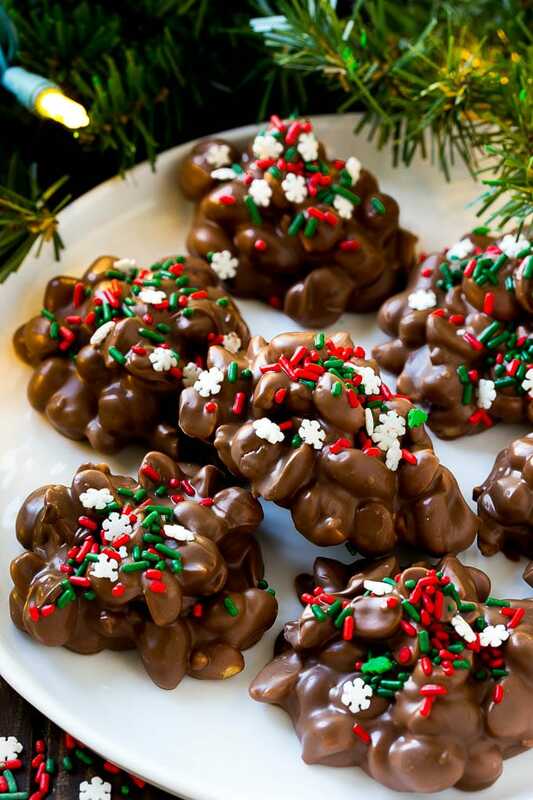 These chocolate peanut clusters will become a tradition in your house! 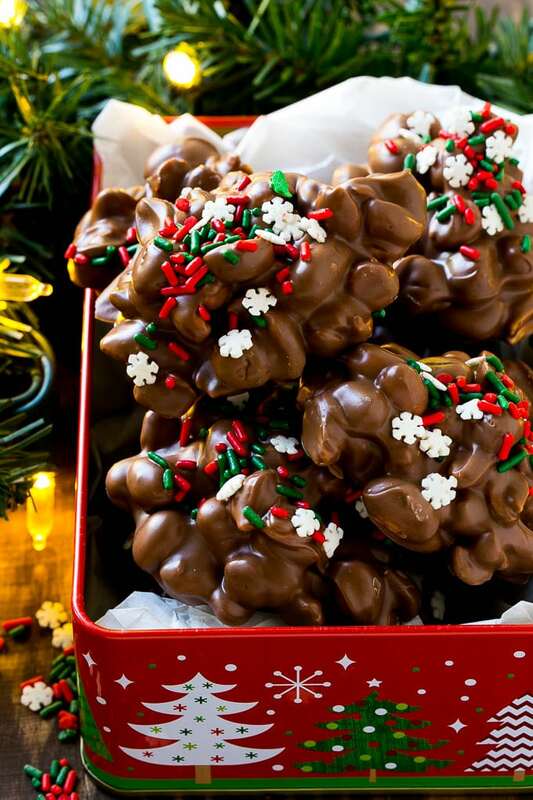 This slow cooker candy only has 4 ingredients – peanuts, chocolate chips, white almond bark and holiday sprinkles. I use a combination of salted and unsalted nuts for best flavor. The peanuts go into the slow cooker along with the chocolate chips and almond bark and they cook for about an hour until everything is melted. Give it a good stir, cook for 30 minutes more, then dollop onto a piece of parchment paper and top with sprinkles. This recipe serves a crowd, it will make anywhere from 25-40 pieces depending on the size of your clusters. If you’re not familiar with almond bark, it typically comes in one pound bricks and is a white candy coating. It’s found near the chocolate chips in most grocery stores. If you can’t find almond bark, you can use white candy melts instead. 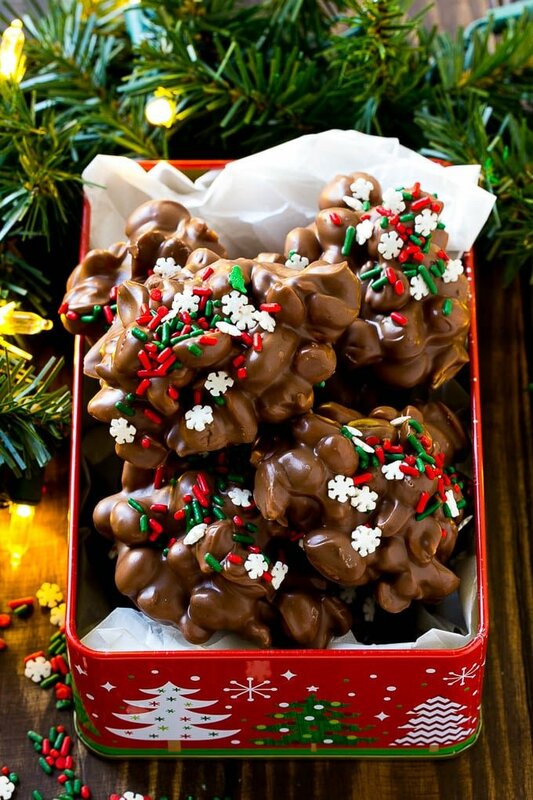 These peanut clusters make such a fun and unique homemade gift. I package them up in tins or cellophane bags to give to friends, teachers and neighbors. If you’re not a peanut fan, you can substitute another nut like almonds or pecans. Another fun way to decorate this crock pot candy is with a drizzle of white chocolate. You can switch up the colors of the sprinkles and serve this candy for almost any occasion, it’s not just for Christmas. This may be the easiest holiday treat around, but it looks and tastes like you spent hours on it! Your friends and family will be so impressed that you made your own candy, no one needs to know how easy it was! Place the peanuts in a crock pot. Add the chocolate chips and almond bark on top. Cook on LOW for 1 hour. Remove lid and stir. Cover and cook for an additional 30 minutes. Stir until thoroughly combined. Drop tablespoon sized dollops of the candy onto parchment paper, top with sprinkles. Cool until firm, then serve. That will work, just press the M&Ms into the clusters when you spoon them out. We just made this today! It’s still warm, but from all the chocolate and peanuts I just licked from the bottom (shh! ), it is delicious! I was honestly adding up the cost as I was dolloping them onto the paper. This would easily be $50+ at the store premade. I found vanilla white chocolate at ALDI in a 24oz container, so I made 3/4 the recipe. Still made a nice amount for our Christmas dessert tray this year! So happy to hear you enjoyed it, Happy Holidays! I usually throw craisons and a jar of mixed nuts also any other chocolate I have and after done a sprinkle of course salt. Ends up like the chunky bars from long ago. Love this idea, I’ll try it next time! What if you don’t have a crock pot? Can you do this on the stove top? What would be your recommendations for a stove top recipe? There is a Christmas party coming up and I would love to make this. Yes, I’d cook it over low heat just until all the chocolates are melted together. Keep an eye on it and stir on occasion, then drop spoonfuls on parchment to make the candy! I love making this.. instead of dropping onto parchment I use those tiny muffin liners. Make giving away much easier!! I think I might try this with almonds.Thanks so much for this easy recipe! The added benefit: the house smells like Christmas! This will work perfectly with almonds! once made and packaged with twist ties how long will they last? do they have to be refrigerated so they won’t melt? They should be good for at least a week, if it’s warm out you could refrigerate, but on a cool day they should be fine at room temperature! Can shredded coconut be added to this? Yes that will work, I’d stir it in towards the end! can the candies be frozen and for how long? Silly question……the package of almond bark is 24 oz. ( at my store) I read each square is 2 oz. Did you just use 1 package or did you have to buy 2? The almond bark I typically buy comes in 1 lb packages. If you only want to buy 1 package of the 24 ounce almond bark, you can scale back the number of servings in the recipe to 23 using the slider bar when you click on the servings number in the recipe card. I made these without the holiday sprinkles since the holiday is over. They were amazing and all of my friends who tried them wanted the recipe! You can refrigerate it for up to a week! The only place I could find white almond bark was at walmart and the ingredients were awful. Would like to add some coconut oil instead. Will that work? How much? And we like dark chocolate. Thanks much! Coconut oil won’t work, you can try using real white chocolate, or even milk chocolate chips. So simple and delicious! Easy clean up too! Could I just use chocolate..why the white melts in recipe? The white melts make the chocolate creamier and help stabilize the chocolate so that it stays shiny and doesn’t get that gray film on it that sometimes happens. You could try it without to see how it comes out! These look delish and so easy. Any idea how many hours it takes for them to set once on the parchment paper, before they can be safely put into a storage tin for a party? They set up quite quickly, they’re ready in about 45 minutes to an hour. wondering about adding pecans if so should they be salted or unsalted? Yes you can use pecans. I like to use half salted, half unsalted because the bit of salt balances out the sweet chocolate. That being said, you could use all unsalted pecans and just add a pinch of salt to the mix! I wouldn’t use all salted pecans, might be overly salty. I was going to try using pecans as well. Can you tell me if I should halves and cut the in half or just leave them. You can do it either way, whatever you prefer! The cover goes back on, I will update the recipe! Yes you can use whatever kind of nuts that you like!